The 10-year anniversary celebrations continue. Any monetary contributions you would like to make to ensure this blog continues ad infinitum are greatly appreciated. In this episode, we’ll examine the Mountain West and the Sun Belt. The Mountain West teams are sorted below by dominance points. 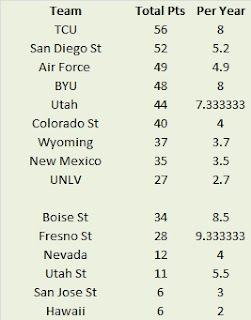 The core teams (nine) that made up the Mountain West for the majority of the time since 2005 are listed first with their interloping brethren listed separately. The dominance that TCU, BYU, and to a lesser extent Utah exerted over the Mountain West can still be seen. Despite playing in the Big 12 for three seasons, TCU ranks first among Mountain West members in terms of dominance points. BYU has been an independent since 2011, and yet they still rank fourth overall (and tied with TCU for the best per season average of the nine core teams). TCU, BYU, and Utah won each of the Mountain West championships during the seven seasons beginning in 2005 during which at least one was a member of the Mountain West. The only other member of the nine core teams to win the conference title was San Diego State. The Aztecs shared the 2012 title with Boise State and Fresno State. 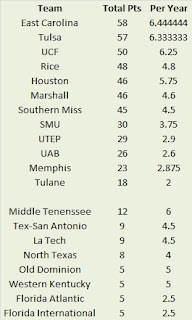 The Sun Belt teams are sorted below by dominance points. 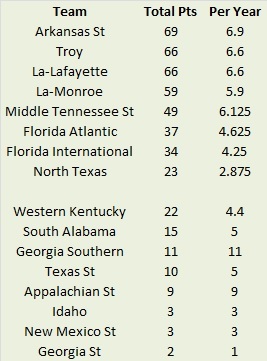 The core teams (eight) that made up the Sun Belt for the majority of the time since 2005 are listed first with the newcomers listed separately. The theme for the Sun Belt in the last decade has been one of sharing. Five of the league’s ten championships have been shared, including a three-way tie atop the standings in 2005. Only three teams, Troy, Arkansas State, and Georgia Southern this past season have won an outright conference title. Arkansas State ranks as the most dominant team of the last decade despite employing five different coaches. A few years ago, Troy would appear to have the dominance part locked up, but the Trojans have fallen on (relative) hard times in the past four seasons after winning five consecutive titles (three shared) from 2006-2010. Former Southern Conference powers Georgia Southern and Appalachian State enjoyed auspicious debuts in Sun Belt play, winning a combined 14 of their 16 league games and finishing first and third respectively. At the other end of the success spectrum, Georgia State is still looking for their first conference win after two seasons in the league. As I noted in the last post, this blog is celebrating its 10-year anniversary this summer. In that last post, I introduced the concept of ‘Dominance Points’ to determine who has dominated their respective conferences. This system is not designed to compare across conferences (say the Big 12 against the Big 10), but it is designed to compare within conferences (the Big 12 in 2005 versus the Big 12 in 2011). In the last post, we looked at two leagues that no longer exist. In this post we’ll examine a pair of extant conferences. We'll begin with Conference USA. 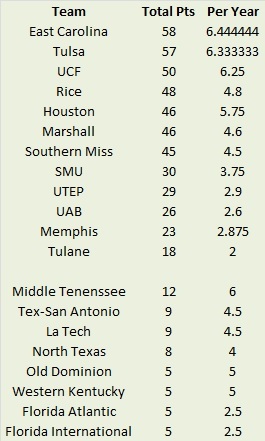 The Dominance Points for Conference USA teams from 2005-2014 are listed below. The core 12 teams that made up the conference for the majority of that time period are listed first with the eight new members listed separately. Conference USA still exists, but it has undergone quite the makeover in the last decade. Seven of the twelve teams that populated the conference in 2005 (East Carolina, Houston, Memphis, SMU, Tulane, Tulsa, and UCF) have moved on to the American Athletic Conference and one team has ceased playing Division I football altogether (at least temporarily). To replace the octet, Conference USA has called up teams from the Sun Belt, WAC, FCS, and in direct opposition to the laws of thermodynamics, from nothingness. While the teams that departed were of varying quality, with the four most dominant teams (East Carolina, Tulsa, UCF, and Houston) being joined by a pair of second division squads (Memphis and Tulane), the heft the league lost was significant. From 2005-2012, 14 of the 16 berths in the Conference USA Championship game were held by teams that are now members of the American Athletic Conference with Southern Miss (2006 and 2011) being the lone holdover who appeared in the title game in that span. And recently, the Eagles have gone through a bit of a dry spell. It is entirely too early to get a handle on how the neophytes will perform in the conference, but Middle Tennessee has finished as a runner-up in the East division during both of their campaigns. 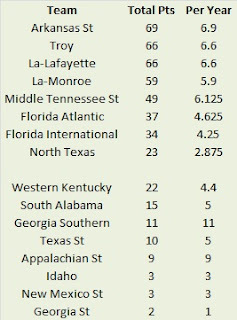 Here are the Dominance Points for MAC teams. Once again, the core teams are listed first, with a pair of teams that have been members at different times in the last decade listed separately. Northern Illinois has dominated the MAC, particularly in the recent past. The Huskies have an active streak of five consecutive West division titles (six overall) and three championships. Central Michigan has also captured three MAC championships, emerging victorious in each of their championship game appearances. In the East division, things have been a little different. Four teams have won the MAC from the East (Akron, Bowling Green, Buffalo, and Miami). Each winner also engineered a mild to massive upset in the MAC Championship Game. Ohio has reached the limits of how dominant a team can be without ever quite reaching the mountaintop. The Bobcats have been consistent winners under coach Frank Solich since his second season in 2006, owning three East division titles. However, the Bobcats have never been able to break through and win the MAC Championship Game, losing twice to Central Michigan and once to Northern Illinois. Bowling Green is the only school from the East division to win consecutive division titles. Temple enjoyed a brief productive period in the MAC, first under Al Golden and then under Steve Addazio before returning to the Big East and later the American Athletic Conference. The Owls never played in the MAC Championship Game, but they did tie for the East division crown in 2009 (with Ohio) and finish a strong second to the Bobcats in 2011. It’s hard to believe, but at the end of July, this blog will be celebrating its 10-year anniversary. As someone who starts a lot of things and rarely finishes them, I am quite surprised I have been able to keep this up for a solid decade. If you’re into nostalgia, or simply a Tennessee hater, here’s a link to my first post (it proved quite clairvoyant). In the interest of celebrating the anniversary, I wanted to come up with a theme I could post about over the course of the summer. I decided to look at each conference and determine which team dominated that conference over the past decade. One way to do this would be to simply look at won/loss record or championships or divisions won. However, I have a lot of free time, so I decided on something a little different. We’ll call them ‘Dominance Points’ and here is how they are calculated. For a conference without divisions, take the number of teams in the conference and award the champion(s) that many points. The larger a conference is, the more points that champion receives as it is ostensibly harder to win an 11-team conference that it is an eight-team conference. Take the second place team and award them the number of teams minus one. Take the third place team and award them the number of teams minus two. Continue on. For example, TCU and Baylor tied for the Big 12 title in 2014. Since the Big 12 had ten teams, both Baylor and TCU receive ten points apiece. Kansas State finished third (there was no second place team since Baylor and TCU tied) so they receive eight points. At the other end of the standings, last place Iowa State gets credit for participating and receives a single point. But what about conferences that have divisions? Give the division champion(s) points equal to the number of teams in the division. So in a six-team division, first gets six, second gets five, third get four, etc. However, if that division champion also wins the conference, give them points equal to the total number of teams in the conference. No double-booking though. Northern Illinois, the 2014 MAC champion, gets 13 points for winning the conference, not 19 for winning their division and the conference. Bowling Green on the other hand, receives 7 for winning their division against six other teams. No attempt is made to break conference or division ties. If three teams tie for a division title, each receives the max number of points, regardless of the team that actually appeared in the conference title game. With that out of the way, let’s delve into a pair of conferences that did not survive realignment, the Big East and the WAC. Both these conferences ceased to exist following the 2012 season. However, they both live on in my memories and as a pair of basketball leagues. We'll start with the Big East. 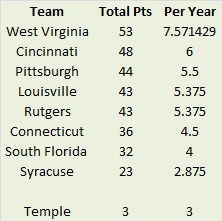 Here are the Dominance Points for Big East teams for the period 2005-2012. The eight teams that formed the Big East for the majority of this time period are grouped together, with Temple (a former conference member) listed separately as they were only a member for one season. West Virginia easily accrued the most dominance points despite leaving the conference following the 2011 season. The Mountaineers never finished lower than second place in seven seasons during this time period. The Mountaineers and Bearcats tied for the most conference titles in this span with four (some shares) apiece. The final season of the Big East featured the always exciting four-way tie at the top of the standings, meaning that of the eight core Big East members, each except South Florida earned at least one share of a conference title from 2005-2012. Moving on to the WAC. Once again, I have listed the nine core members separately from the Lone Star neophytes who were present for just a single season. Amazingly, Boise State did not accrue the most Dominance Points, primarily because they were only in the WAC for six seasons. 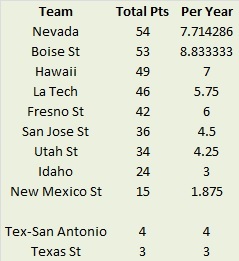 Nevada enjoyed an extra year in the conference and still only edged the Broncos by a single point. After the heavy hitters departed, leaving the WAC a shell of itself in 2012, the Aggies from Utah State won their first conference title since the sharing the Big West championship in 1997 (interestingly, that was also a micro-conference). Full disclosure, I have been pulling for Kevin Wilson ever since he became the head coach of Indiana prior to the 2011 season. I remembered him from such coordinating duties as North by Northwestern and Sam Bradford and the Fortress of Solitude. I had hopes that his brand of offense could bring a consistent winner to Indiana for the first time in nearly two decades. In four seasons, Wilson has gotten the offense humming, nearly pulled off bowl eligibility, and helped Tevin Coleman put up ridiculous video game rushing numbers. Alas, despite those successes, the Hoosiers have yet to have a winning season or qualify for a bowl. With that in mind, did it make sense to bring Wilson back for a fifth season? To answer this question, I looked at coaches from Power 5 (formerly BCS) conferences who did not post a winning season in their first four years and were brought back for a fifth season. I examined how long they lasted at their respective school after the fourth season and what record they produced. I went back and looked at any coach who was coaching during the BCS era (since 1998) because as far as arbitrary dates go, this gives us a decent sample of coaches. In all, twelve coaches in addition to Mr. Wilson, were able to coach four seasons without posting a winning record and were allowed back for a fifth season. The table featuring the twelve coaches is listed below sorted by winning percentage in the first four seasons. In depth analysis to follow. I’ll start with what I think is the biggest takeaway. Among coaches with losing records in their first four seasons, winning percentage appears to have no impact on how long they stayed at the school or the success they enjoyed. The winningest coach among the cohort, Terry Allen (no, not that Terry Allen) lasted just one additional season at Kansas. In addition, the coaches with the longest tenure, Schiano and McCarney, ranked ninth and tied for eleventh respectively in terms of winning percentage. For me, the second biggest takeaway is that half of the coaches on this list qualified for at least one bowl, with four (one third of the sample) qualifying for multiple postseason appearances. And finally, and this takeaway should be obvious, is that with the exception of Colorado (and that is arguable now), none of these schools is a traditional power. That makes perfect sense. At a school like Alabama or Ohio State, you won’t keep your job for four seasons if you fail to produce a winning record. Meanwhile, at a school like Duke, you are afforded a little more leeway. Other interesting (to me) statistical minutia follows below. Who is Tom Holmoe? I have been obsessively following college football for a decade now and was more than a casual observer for about twelve years before that, but I have to say, I didn’t recognize his name. Anyway, under his watch, the Cal program cratered before Jeff Tedford revived it. Dan Hawkins actually got Colorado to a bowl game in his second season, but the Buffs lost that game to finish with a losing record (hence the asterisk). He probably would have been fired before his fifth season, but the school didn’t have the money. My alma mater actually had the most patience, letting Jim Caldwell get away with six losing seasons before bringing him back for a seventh. Caldwell rewarded the patience with a bowl win, but was fired after another losing campaign in 2000. The move was good for both parties as Wake would go on to hire arguably the best coach in school history, while Caldwell would enjoy considerable success in the NFL. Granted he was asleep at the wheel in Super Bowl XLIV and proved himself to be a coward or slave to conventional wisdom this past January, but he won a bowl game at Wake Forest, a claim only three other men can make. Another coach from this list (and from Indiana) also got to lead an NFL team. He did not have quite as much success. So, in summary, if (relatively) recent history is any guide, bringing back a coach with four losing seasons to begin his career is not necessarily a bad move. With a Las Vegas over/under of six wins, statistical projections expect Indiana to be in the mix for a bowl bid in 2015. Waiting another year or two instead of blowing the whole thing up is probably a prudent decision.